Last week, the hospital I work at hosted a conference on the role of Virtual Reality in medicine. After strolling through demo booths, here are the top five companies and products that blew me away. AppliedVR is a startup that provides VR equipment and support for hospitals to use to manage pain. It’s a simple business, but it makes sense. Virtual Reality is incredibly immersive, which studies have shown can effectively calm patients and distract them from anxiety and even physical pain during procedures like blood draws. Setting up and maintaining equipment and software is something most hospitals are unlikely to be prepared to manage, so AppliedVR encourages them to outsource it. Regardless of AppliedVR’s future, the future of VR to transport patients away from their bodies during medical procedures and to provide mental stimulation to patients confined to a hospital is all but certain to assume a place in hospitals in the future. Jack is in the back, demoing the headset in a psych professor's very funky backyard pool. The Dolphin Swim Club is a company focused on manufacturing a waterproof VR headset, primarily for allowing patients to simulate swimming with Dolphins. It’s a strangely specific goal by a married Dutch research team. They felt that swimming with dolphins was a powerful experience, but that the logistical constraints of bringing patients to dolphins was heavily limiting, and that dolphin captivity was inhumane. 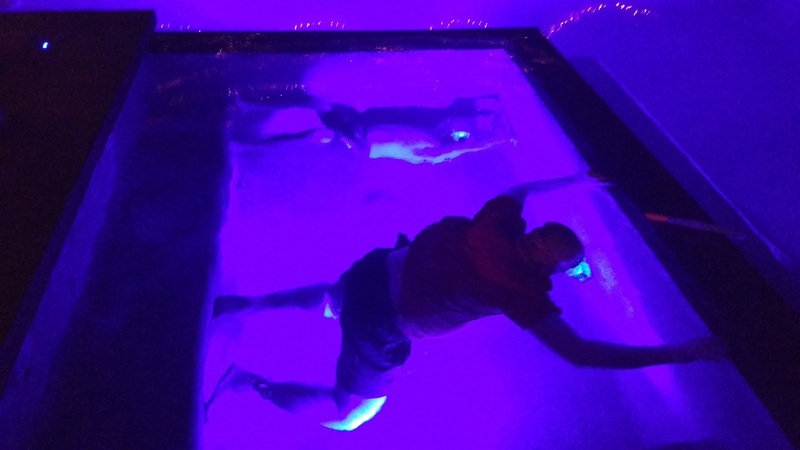 So they did what any sensible Dutch scientists would: filmed 3D encounters with wild dolphins in Egypt and then 3D printed a waterproof enclosure for a VR-capable smartphone. They held a demonstration in the backyard swimming pool of one of the conference’s keynote speakers, and their product was deceptively well designed in its simplicity. The dolphin experience was great, but the larger potential comes from exploring VR while weightless. VR presents unusual sensations due to its lack of physical forces. Submersion disables much of the proprioception that VR contradicts, creating an ethereal sensation that I expect to become far more available over the next three years. 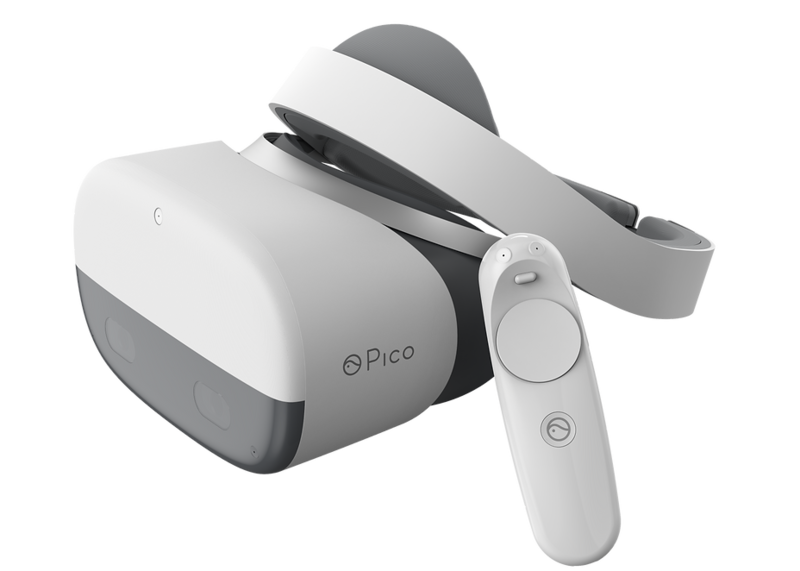 The Pico Neo is a cordless VR headset with resolution, refresh, tracking, and processing currently only seen in corded VR headsets. All VR requires compromises. Conventional stand-alone systems, in which the computation, rendering, and tracking takes place inside a smart-phone or similar device compromises on almost every feature. Premier systems like the Vive and the Oculus seek to impress a user with an experience that feels real by processing the graphics on a full-sized computer and tracking the headset’s position with surrounding cameras, and using video resolution and refresh rates higher than found on most smartphones. This requires a tether from the headset and a substantial amount of setup. Pico is trying to build a device that uses a superior method of tracking and a lot of custom hardware to miniaturize the processing and tracking so that it can fit inside a stand-alone headset. They still have to make compromises, but fewer than you’d expect. This is pretty simple. It’s really just a video game-based training simulator for doctors. It looks like Elder Scrolls, if Elder Scrolls had 50+ quests where an old person in a checkup room answered questions about their symptoms and responded physiologically to drugs and procedures. In my simulation, I shined a pen-light into the eyes of a 60 year-old female complaining of disorientation to confirm that she was not exhibiting signs of a concussion. She even responded to questions I asked verbally. It’s a simple thing, but just another demonstration of how well-executed VR can simulate most jobs as a form of training. *This is only meant to communicate how long this idea has been around. In the actual episode, Lionel Luthor's VR system has no haptic feedback system. They just wear goggles and wave their arms in the air.